For A Recovery Mission - Free Way to Support Us! Foxfield F.A.R.M (Foxfield For A Recovery Mission) is an IRS registered 501(c) (3) charity that has been established to provide an equestrian groundwork training program for U.S. Veterans with PTSD and related issues incurred through military service. Similar programs throughout the U.S. have proven to be successful in support of Veterans' transition from the battlefield to the home front and an improved quality of life. This curriculum will be offered at absolutely no cost to any Veteran pre-qualified for participation in the program. Concentration is on the handling, feeding, veterinary care, exercise, safety instruction and rehabilitation techniques for equine maintenance. Practical work will also include trailer loading, body trimming, lunge work, stall maintenance, farrier care and the ability to recognize common ailments associated with equine health. In addition, this program will incorporate the re-purposing of rescue horses and locating new, responsible owners. The synergy of the work invested by the Veterans to aid the recovery/rehoming of these horses is equitably therapeutic. 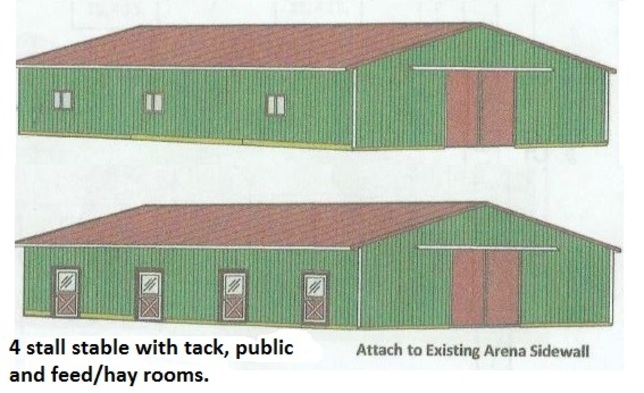 This project will ad 4 stalls to our existing 4 in order to accommodate additional rescue horses. It will be attached to our existing indoor arena which we personally built to allow the program to continue during inclement weather. We want to start construction in the Spring of 2017. We'll donate to For A Recovery Mission when you shop online! Once you’ve made a purchase with one of our participating stores, we make a donation in your honor to For A Recovery Mission. Over $13 million has been raised so far!